Okay, let's go dancing?! You could spend part of your day learning to do this for free! They had merengue lessons for an hour and then you could put your skill to the test each night at the disco. What was awesome about the disco at this resort, was that it was right on the beach with a cool ocean breeze waving over the crowd every few minutes (armed guards made sure that people didn't come in or out, and after the initial shock of seeing them there, you don't really think about it again). After missing the first few nights partying, we finally ventured there. And guess who we ran into, hehe?! Of course the Girlies from Newfoundland. Sadly the rain continued. Overheard at dinner the disco roof had leaked and there wouldn't be any dancing tonight. We instantly decided that we'd check out the nightly show instead (I enjoy the entertainment at resorts, it's usually so lively and inclusive, be sure to try out at least one show during your stay). Confirmation of the closure was made when we ran into the NL crowd. Before dinner, the Girls were trying to pick up all their belongings and find places to dry their things, as resort staff came to do something with the 2 inches of water that had turned their room into a splash park. 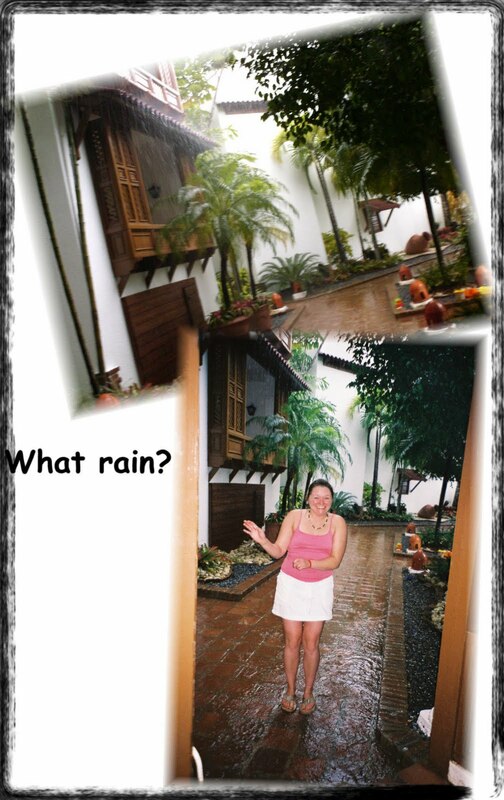 :( I couldn't believe that their first floor room had flooded from the endless rain. What a state. We called it an early night, with so much water, there wasn't a lot to do anyhow. Tomorrow would be our first time off resort. We'd booked an all day excursion with, Puerto Plata Runners (the company is called Bavaro Runners). Truthfully, we could probably use a few extra minutes of sleep tonight. Buenas noches ("good night"). Our resort was amongst many in a compound of at least 20 hotel complexes, Playa Dorada was its official name (gated and guarded). In amongst these resorts was a main road in and out, a golf course and a disco club, where locals and tourists could party it up. We met our jeep safari rig, a white and black striped tour bus, complete with our guide, Zeek and our driver, Mauris, out front of our lobby at 8am. A few other stops within the compound, and we were out the gate into a city of thousands. 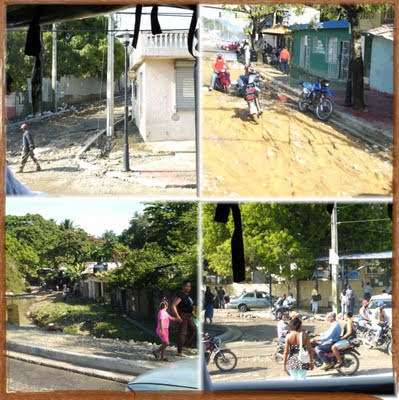 Most of whom were in this madness of motorists, known as streets, where chaos lived in the absence of driving rules (also known as Puerto Plata). You must keep to your side of the street, but sidewalk use is permissible, as is weaving in and out of traffic (however you get to the head of the line, so be it). No seat belts (except on the tour bus) are necessary and entire families can travel on one scooter or motorcycle with or without helmets. The rain from the night before had finally ended and gave way to a sunny, bright start to our day. Driving through this city, we quickly realized the devastation of last night's storms. Streets were washed out, people’s homes were flooded, neighbours were helping neighbours empty out entire households of furniture and personal belongings, in hopes that warm sun would dry it all out. The deeper we ventured into the city centre, the more my heart became overwhelmed. I wasn't without tears within the first 15 minutes of being stuck in traffic and witnessing a completely different world than that of which I had been exposed to in Playa Dorada. No wonder they think of us as 'rich tourists'. Children were playing on backs of trucks as if this area was their front lawn. So many buildings and homes appeared to not have survived the storm from last night, or the storm before that and likely not even the one before that. And here we were driving by in our rented vehicle, complete with a driver and our fancy sunglasses...staring, take pictures, in aww of how different it was out here compared to our resort and real lives. Perspective and gratitude seemed to be the theme this morning. An adjustment of thought that I didn't even know I needed, but certainly welcomed. There were many people driving fancy cars, chatting on cell phones and wearing the latest brand name clothes. Then, there were people walking around without shoes, all sharing the same sidewalk. Things were balanced here, all relevant to their way of life (the more Zeek talked and explained, the more I understood that my way of life wasn't better or worse, only different). Going-seeing-doing can teach you things you may never have understood otherwise. I need to travel. A smile returned after passing by this little cerveza shop (or maybe it was a convenience store?). A small group of men were sitting outside with maracas, drums, guitars, accordions playing away. It was so neat to hear their happiness in amongst the sound of idling engines and revving bikes. The big sign next to the shop says "Happy Hour starts daily at 8 am" hahaha. This place was awesome. Police directing traffic in the absence of street lights, a university, a rhum factory, shops and stores, crazy drivers and the smell of exhaust. 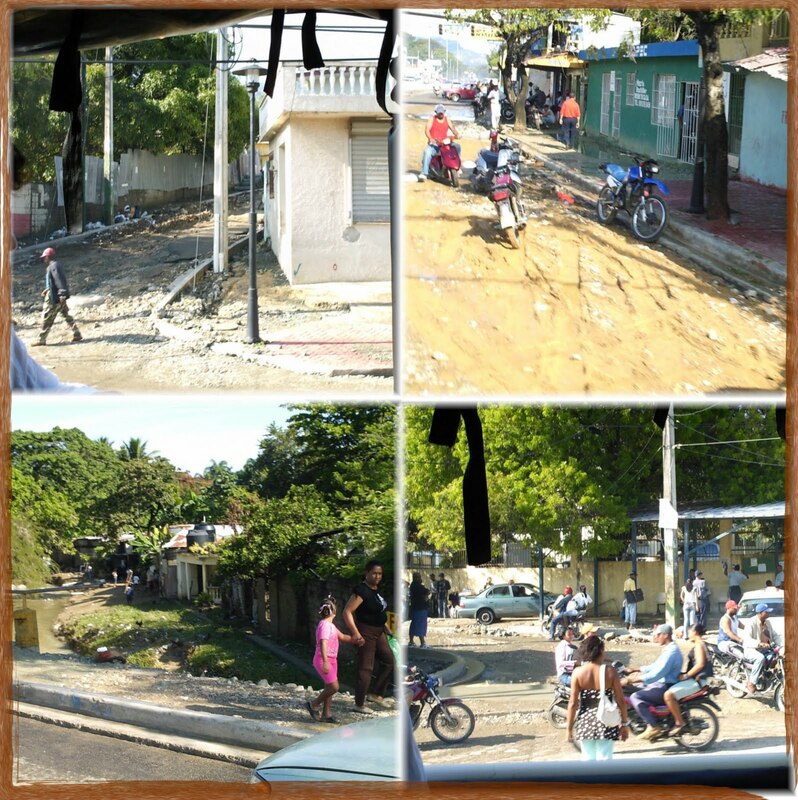 I fell in love with Puerto Plata and so wished I could get off the bus to go meet these people. We drove out into the country. The rain from the previous night resulted in our jeeps waiting for crews to come repair entire roadways on at least three occasions. I mean full scale construction: loaders, excavators, gravel trucks. They’d finish one site, then drive ahead of us to repair the next. Zeek, our guide, was awesome. He explained so many things and I mentally tried to capture everything he was saying about everything there was to see and know. We visited a small farm, where we tried fresh ground coffee, played with the animals and saw how things were made. We visited inside the family's home. Of all the things I remember, there was a TV in the bedroom (just a small one) but the electric cord looked as though it had been cut and taped back together about 6 million times. It was so thin and unsafe looking. But then I noticed that it wasn't just the TV's electrical wiring (yikes). We stopped at a cigar making place. It was a tiny little hut next to the road with a very small tobacco plant garden out front. Had an opportunity to meet some children during our brief stop at the school house. And then continued on, to our next stop where we'd enjoy a Mexican meal at the most beautiful beach. A little time set aside for swimming or horseback riding. Our party of three split the decision on this and two went to play in the waves, while the other trotted down a beach side trail on a white horse, with a lovely group of fellow travellers. The entire time on this safari ride was "happy hour". They served up beverages from our first stop till our last. What a day. Late afternoon our jeep began its journey back to our resort. Happy hour continued well into the evening and when it was time to decide whether to stay in or go out, well, I went to find my friend Stephanie to see if she wanted to venture out. 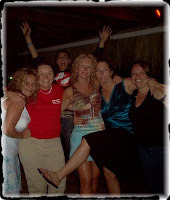 :) The Mangue disco was the name of the bar within the compound of Playa Dorada where locals could join in the fun with the guests of the neighbouring 30 resorts. It made us feel as if we were leaving the resort, without leaving. Cruz (a wonderful new friend from the DR originally and now visiting while on vacation) led the way into the bar. It was so very helpful to have someone who could speak Spanish and assure our safety this evening. Wild. This place had cages in the corners with dancers. They had people up on the bar and bartenders armed with lighters who would light the exhale of patrons as they’d take a shot and instantly become fire breathers. Flames shot far and fast as people applauded and woohoo’d. What an experience. We were gently tugged here and there to go dance. Smiles, winks and nods in abundance. I can remember witnessing the most beautiful drag-queens here. Cruz once had to tell me to stop staring, but I wasn't staring because I was anything but amazed at their beauty, absolutely gorgeous. We left the bar and began our walk back to our resort in the wee hours of the morning. Stephanie and I, arm in arm ... a good friend is someone who will assist you on your journey. A best friend, will laugh to pee themselves if you should fall off a sidewalk or perhaps, run into patio set haha. We didn't leave the bar area without stopping for a bite to eat first, I wanted a hotdog. :) Remember when I mentioned earlier that it was a common misconception for people to think that the food here was anything like the food at home?! OMG - EWE. This hotdog didn't even come close (although when I ordered it, I thought for sure that it'd be the same: 'a hotdog is a hotdog' or so one would think). It was disguised as a regular looking hotdog, but the instant I bit into it, I knew I had been fooled. It tasted like a rubber hose smothered in sweet tomato paste. Every bite hurt a little more, but I ate the entire thing, Cruz had bought it for me and I didn’t want to be rude. Oh my poor taste buds (I'm just lucky it wasn't "oh my poor belly" lol). Okay wait. Is it just me, or is this vacation going by way way too fast?? I'm so glad you've decided to join us on this adventure. I hate to (I'm sorry), but I'm going to do it to you again and take a little break right here. This gives you a whole week to fill your bubba keg, grab your room key, your towel & your waterproof camera for the swim-up bar at the big pool. And while you're at it, you might as well bring some tissues as we say goodbye to all these wonderful people. DR trip - part IV "No, No, No, No!!! I'm not ready to go yet!" will be the title for the next (and final post) of this adventure. There are hills (even mountains) in the DR! The results from the Weekly Survey Question: Are you a dancer? And yeah...where are those guys from Norway? We'll find them, lol. Its very nice blog. thaks for sharing. I loved Playa Dorada. Puerto Plata, Dominican was my first vacation destination and the DR has remained one of my favourite places to visit. So beautiful. So many wonderful people. 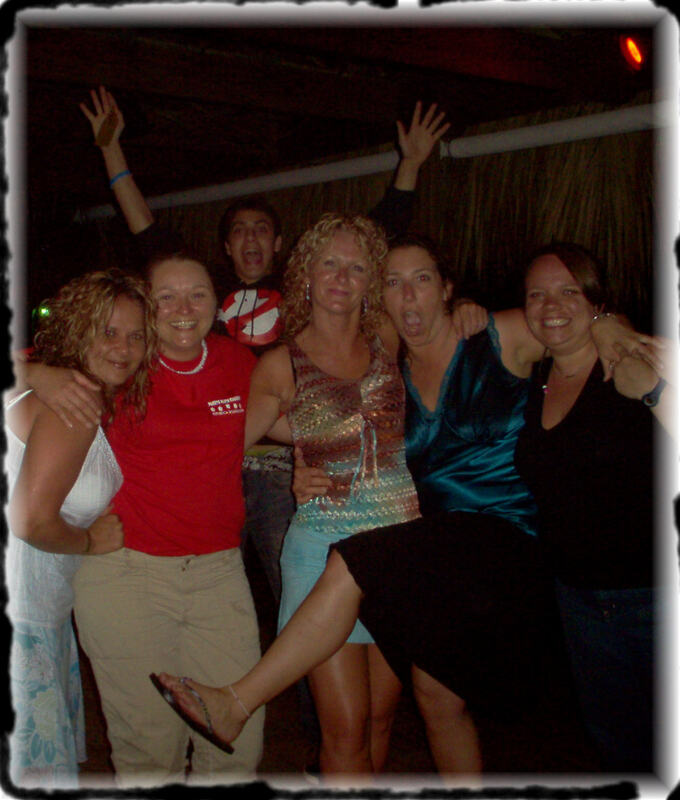 Thanks for sharing your experience in Playa Dorada, really looks a fun place. I hear the golf there is very good as well. Thanks for sharing really interesting article on Puerto Plata. I understand there are also some great golf courses in the Dominican Republic. Hope to visit soon.